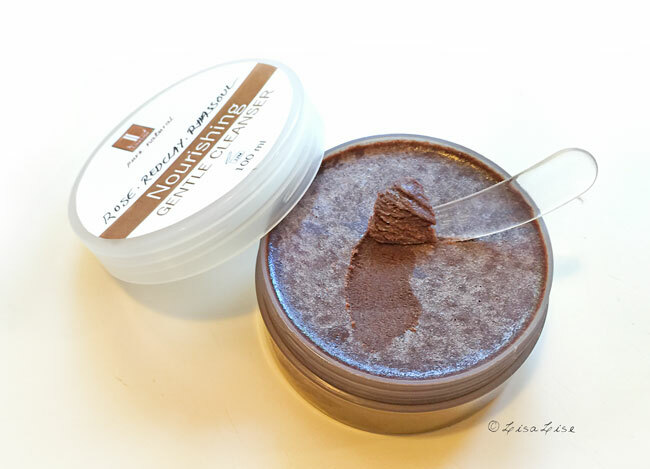 Looks like chocolate, smells like rose, feels like silk, and cleanses and nourishes skin like a dream. 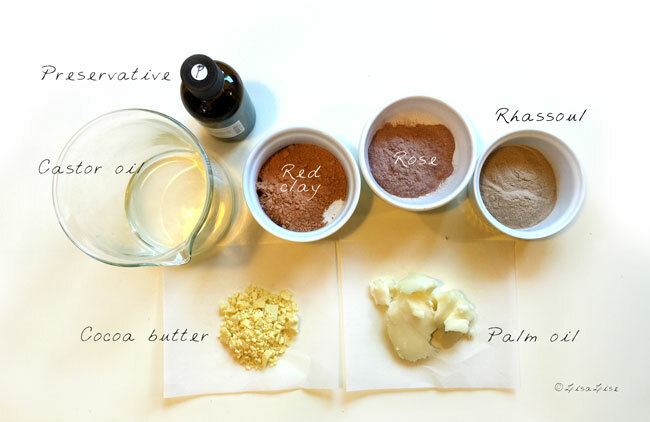 Today, we're going to combine powdered rose, rhassoul and red clay for this no-soap, skin-loving cleanser. If you haven't tried making or using a soap-free face cleanser yet, maybe this how-to will inspire you to give it a try. Don't worry if you don't have these exact ingredients at hand, I've listed possible substitutes. Here's how I put this product together. Always measure your ingredients by weight. If they are liquid, place a container on a scale, and pour until the scale measures the desired weight. Easy peasy! Melt the fats and oil slowly over low heat - monitoring the mixture at all times. You don't want to overheat! I've been doing 2 different formulas simultaneously as of late, so what you see above is the basis for 2 cleansers. When the fats are just about to be fully melted, remove from heat and stir until thoroughly melted. Add remaining ingredients, stir, and pour into a jar. Let set until cool. (15 minutes in the refrigerator should do it if you want to speed the process up). Pictured at the top: the final product. Adding a label is optional, but it's a real good idea to note the production date and place it on the bottom of the jar. This face cleanser looks amazing! Is the preservative used because of the rose powder? What preservative did you use for this product? If I don't use rose powder, can I discard the preservative? Bonjour Audrey! Thanks for your kind words. The preservative is added because this product risks coming into contact with water. It is a face wash, and will be 'living' in a bathroom environment. Wet or moist fingers are dipped into the mixture with every use. If water is introduced to the mixture in any way, the product must be preserved. I'm such a huge fan :) I LOVE YOUR BLOG! Can you please tell me what preservative you use? I made some clay bars from your vast collection of recipes :) Put them into silicone molds and am having trouble getting them out, they are quite soft even after a few days. Do you think it's OK to re-melt them, then add the preservative? I'm worried about bacterial/mold growth. Also want to pour them directly into jars. HI Annie - Thanks so much for your kind words! As for preservative: If there are botanicals (powdered herbs, flowers etc), then nothing short of broad spectrum preservative will do. Phenonip is good for this kind of formula. You'll find it at various soap making suppliers - try LotionCrafter (if you are in North America). 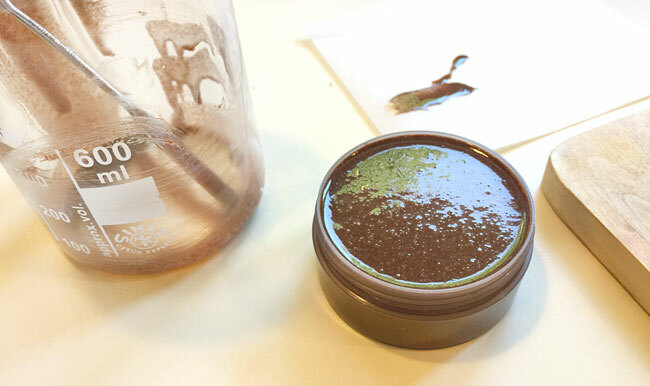 As for hardness: if you prefer your product in jars, yes, you can remelt and add your preservative, then re-pour. 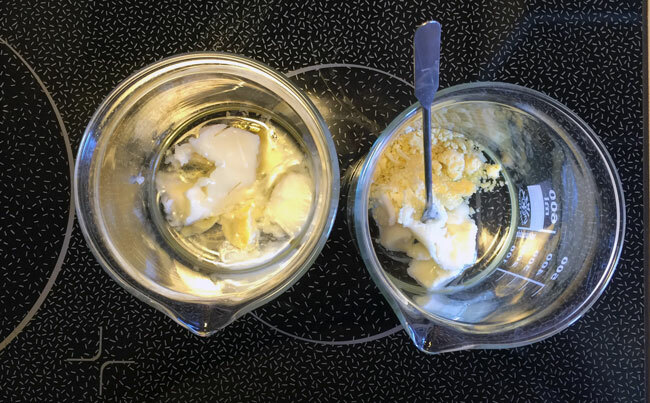 Or, if you are looking for a bit more hardness and want to go back to the molds, try adding a bit more hard butter (such as cocoa butter) to your batch when you remelt. Best of luck with it! This is such a nice idea for a face cleanser! I will definitely try this soon. I'm just waiting on a new package with clays which I ordered. I am happy I came across your blog, so far I am very much enjoying reading it. HI Anna . Thanks for your kind words. Feel free to ask questions any time. Sorry for being so ignorant but for this recipe how many oz or grms are recommended of preservative and which one you recommend. Alma I apologize -- I just noticed this recipe is indeed in grams and not percent. For this particular batch the total gram weight is 131, so 0.8% would equal 1 gram. I noticed that the castor oil is in 'ml' and not 'gr', and then you say "always measure by weight", is 'ml' correct or should it be 'gr' ? Thank you for spotting this Crystal - it is indeed a glitch! Yes, it should say grams instead of ml. I will correct this. Looks absolutely fab.. any advice on how this can be used? I was wondering what could be used in place of palm oil? I know in soap Coconut can be used would this be the same for this face cleanser? Hi Jax - This will set at a normal room temperature as is common to Northern Europe. If you live in a warmer climate, you may need to adjust the amounts. Try adding more cocoa butter to get your mixture to set (you can do this with the one you have already made by simply remelting and adding more cocoa butter. For your next batch, try adjusting the oil DOWN 5-10% and the cocoa butter UP accordingly. Some people like this cleanser to be as soft as possible where others prefer a harder set. You'll have to play with the proportions until you have what you want. Best of luck with it and feel free to drop a comment and let me know how it goes! Are Preservatives Necessary in Make-up?